who is interested in software development and consumer electronics. I began programming at the age of 13 and am fluent in JAVA, C, C++, Python, and various microcontroller topics. I have also published to the Google Play Store under the account "JiStudioz". In my free time, I enjoy reading Science-Fiction novels, playing around with new gadgets, watching T.V. shows, and going to the gym. I also practice martial arts and am particularly fond of Mixed Martial Arts and Filipino Esckrima Fighting. Scroll down to see some of my personal projects! Bruin Dining Backend - API endpoint for UCLA dining hall menus, recipes, and more! The Bruin Dining Backend API was developed in the frustration of individual developers on different platforms having to perform their own webscraping of the UCLA dining hall items. Now they have an endpoint where they can merely perform GET requests to get menus, prices, ingredients, recipes, and more for dining halls and fast food cafes in well formatted JSON. Developers can use this API in their web/mobile applications or to do statistical analysis on the variety of food options offered at UCLA. As associating Android Application is in the process as well! These last two years I took part of the MicroMouse competition where we spend an entire year designing a robot to solve a maze autonomously. I used Autodesk Eagle to design the schematic and PCB of the robot and MBED to program the MCU (an STM-32F411). The robot ended up placing in the top 15 at both the UCLA and UCSD competitions in 2017, and placed 2nd place at both competitions in 2018. I intend to do this competition again to improve my robot and place 1st! C.A.R.M. - communicating across random masses - is a Chrome extension created from the frustration of having so many different sources of communicating with people of the same interests. You have Slack, WhatsApp, Facebook, Discord, and other means ... but the one thing in common between people is the website that they will be on when discussing a topic. Through C.A.R.M., anyone with the extension can communicate with anyone else on the same website that they are on! REM.my - A smarter alarm system. An alarm maker for the Android Play Store that optimizes a user's sleep based on their REM (Rapid Eye Movement) cycle. All a user has to do is input the latest time by which they wish to wake up, and click on a button to set an alarm. The app takes into account that the user will take about 15 min to fall asleep, and creates an alarm that will wake the user only after finishing a complete REM cycle; thus leaving them refreshed and energized for the day ahead! I worked with the Release to Production (RTP) team at Facebook to work on their automated testing tool for their next generation hardware pieces. My primary contributions were the automated updates of test results that saved several hours for every engineer on the team, and the enabling of a more logical grouping of tests and hardware pieces so that automated re-testing could be possible. I also integrated a more polished method of reserving hardware so that the scare resources could be better shared amongst the validation leads. As a side project, I also worked on the validation portal to fix inconsistencies in the UI, backend, and database, and speed up queries. In the end, I was able to fix most of the bugs in the portal and speed up load times by more than 50%! I worked with a team to create the infrastructure to monitor data from the routers and visualize the data to gain valuable business analytics. For the infrastructure, we used Docker containers and Apache Flume to create a flow of data from the Hubs to our local lab environment. We then automated the infrastructure deployment and AWS/VMware VM provisioning process with Ansible in order for it to be generalized for any future deployments. Once production data was being captured, we processed the Spark streams with the data using Scala and stored the processed data into OpenTSDB. We then graphed data using Grafana to let business leaders make critical decisions of the Arclight network. I primarily worked on the company's Master Data Management (MDM) product to tailor it to individual customers' needs. This responsibility included developing and modifying features in the API (Java, Cassandra, Elasticsearch), UI (Qooxdoo), and metadata configurations (JSON). In addition, I also found and fixed several major bugs within the product's code base before the next version of the API and UI went live. Throughout the internship, I used Git extensively to manage my workflow and simultaneously work on the code with developers from around the world, and gained a critical understanding of both SaaS and PaaS models of service and how either can be beneficial for a company's future. I created a website for one of the company’s products and researched various markets and business opportunities for the company’s future. I also tested product software for accuracy and competency for market use. I also concurrently interned at SmartMonitor, splitting my time according to each of the companies' needs. I tested the smartwatch the company produced and assisted in designing and pitching a new product idea to Genentech. Furthermore, I also designed a new prototype product for the company and created a business plan analyzing its potential market and opportunities. I also concurrently interned at IntelliVision, splitting my time according to each of the companies' needs. I am currently one of the Project Managers and oversee all the projects and manage the IEEE lab. Previously I was one of the workshops managers and created various workshops for members to attend during the school year. Before that, I was one of the co-leads for OPS, Open Project Space, a program where we teach first year students about microcontrollers like the Arduino Nano and create various circuitry related projects. The goal is to spark interest in electrical engineering while giving the opportunity to have a hands-on experience. 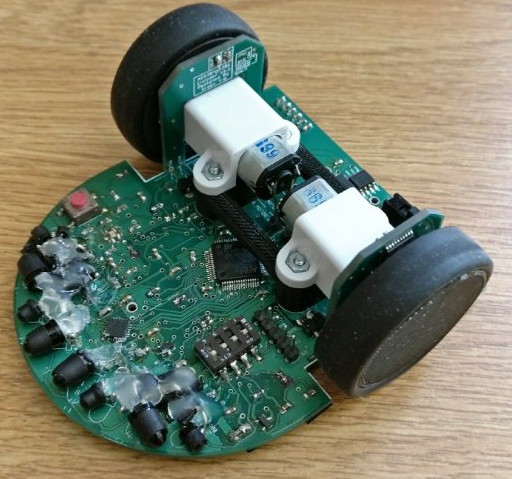 Additionally, I am also part of the MicroMouse project where we build an autonomous maze solving robot. Competition is held during May and last year, we were able to take 2nd place at the UCLA and UCSD competitions! In UCLA's Super-Mileage Vechicle organization, I am part of both the "Hardware" and "Software" sub-groups for the Electric Vehicle team and also help co-lead these teams. In this group, we learn about the various systems and components that make up an electric vehicle and then design and test these components (such as making sure a Brushless DC motor spins at the most efficient rate, or creating the lights and horn for the vehicle) so that the vehicle can compete at the Shell Eco-Marathon competition. I inducted into this honors society in May of 2017 and served as the Membership chair for the 2017-2018 school year. This position's responsibilities include facilitating the induction process and requirements for inductees as well as tutoring students in various EE and CS topics. I am now an active member of the organization and attend various events. I inducted into this honors society in December of 2016 and have stayed as an active member by attending UPE hosted events and tutoring members in various CS topics. I was one of the Co-Founders of Teen Hackathon, and served as its VP of Finance, where I helped contact with potential sponsors and worked with them. Addtitionally, I created and managed the budget of the event, and during the actual event, helped work behind the scenes to keep it running smoothly. Overall, it was quite a success as more than 150 students came to the PayPal headquarters for the first ever educational hackathon! As one of the Directors of Finance, I helped create the budget of the event and contacted with potential sponsors to fund the event. Additionally, during the event, I held HTML and CSS workshops to teach students, and even some teachers who came out to learn some programming, and worked on other tasks to keep the event running smoothly. The event was such a success at my school that it is projected to take place every year now! In my four years of membership, I have placed in the top three at the district level more than 5 times for various different events, twice at the State level for entreneruship and once at the state level for a hospitality case study, and even got second place at the international level for the hospitality based case study. Additionally, in my junior year of high school, I served as the Director of Entrepreneurship, where I managed more than 90 students in the entrepreneurship category, and qualified 8 teams for the international competition. Not only did I learn a great deal about web-development from this club, but I also served as its Manager of Events for one year, where I helped organize events such as company tours and hackathons for members to work with. One of the events that I helped organize was Monta Vista HACKS, and I even held an HTML and CSS workshop there to teach others about web development!